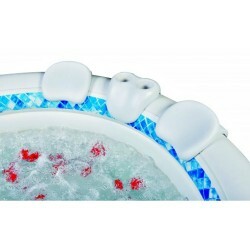 The High quality durable dual pillow headrests and double drink holder are designed to sit securely on the spa wall. Flexible EVA material offers soft comfortable support for your head and neck. Place the Simplicity Spa anywhere- your back yard, patio, or tote it along in your RV. No time-consuming or costly installation- simply remove the spa from its box, plug in, connect inflation hose to the pump - press a button, and watch the Simplicity Portable Hot Tub inflate in minutes! Relax and escape from your daily routine and enjoy a peaceful rejuvenating soak in the warm therapeutic water of an inflatable spa.